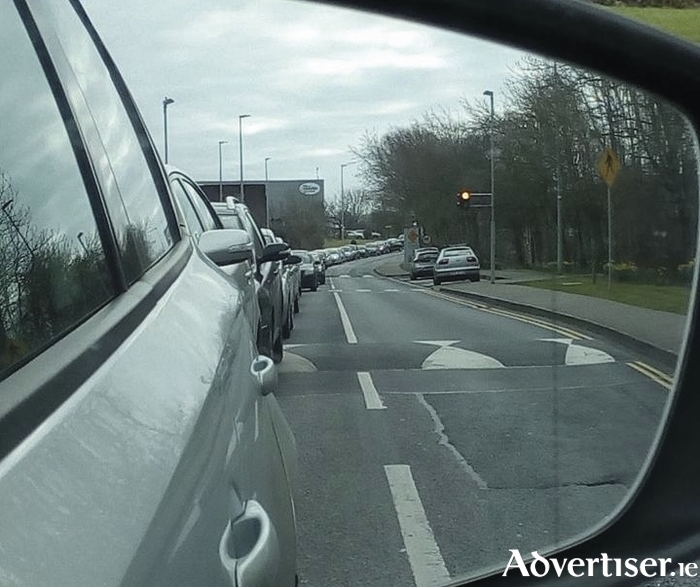 Tailback during recent traffic congestion at Parkmore. The traffic situation in Parkmore Business Park is "not only an inconvenience, it is dangerous". With people "caught in their cars for over an hour", demands are being made for the gardaí to be brought in to deal with traffic management at peak hours. "It was an utter disgrace that no one thought of a traffic strategy while developing this business park," he said. "People stuck for more than an hour outside their work place in the evening are panicking, getting anxious, and this will, and does, lead to aggression - which no one needs trying to get home in the evening. Last December, workers at Parkmore were informed that a working group had been formed "to find and drive solutions to traffic issues" at Parkmore. The Parkmore Traffic Action Group includes the Galway city and county councils, and the IDA. The notice said the IDA intended to apply for planning permission for construction of a new link road and junction to connect with an existing access road, within the park, to alleviate traffic travelling to the N17. "I eventually made it home at 6.15pm when normally I would be home at 5pm," he told the Galway Advertiser. "There is widespread anger in the business park at the moment and people's lives, appointments, and arrangements are being put in serious jeopardy." In response to Mr Cooley's criticisms, the IDA, in an email to him, admitted the situation "is unacceptable and hugely frustrating for employees". It said the IDA is will continue to work with the Parkmore Traffic Action Group "to advance a range of measures to alleviate and solve the problem". Sinn Féin city councillor Cathal Ó Conchúir has called the situation a "disgrace". Her said he intends to ask the other councillors to join him in meeting with City Hall's traffic Corps "to see if they can provide a temporary solution to the problem".